Each piece in this album has its own character and demands a different approach. The carrousel is chosen as symbol for this diversity. Levan Tskhadadze (clarinet) and Izhar Elias (guitar) play their instruments with an incredible transparency, refined articulation and subtle musical colours. It is their own story they create. Their music speaks as if they are talking with each other through their instruments. This album, with it's wide stylistic span, yet cohesive musical end result, is proof of this musicians mastery. And thanks to the sublime sound quality, every single inflection is audible. Clarinet and guitar is an instrumental combination one seldom hears. A puzzling fact considering that the clarinet's timbre can be light and intimate, therefore very well suited to the sound of the guitar. The Georgian background of Levan and Izhar’s Jewish ancestry made celebrated Georgian born, Israeli composer, and close friend of the duo, Joseph Bardanashvili a natural choice. Joseph Bardanashvili worked closely together with Levan and Izhar arranging two of his compositions. In Lezikhro the use of multiphonics, which is quite difficult to do on a clarinet, were explored in order to best express the sad and mournful atmosphere of the piece. Lezikhro is the toast Jewish people bring when commemorating the loss of their beloved one. In his masterpiece Sola Bardanashvili combines very old Spanish/Jewish (Ladino) melodies with traditional sounds from his homeland Georgia. 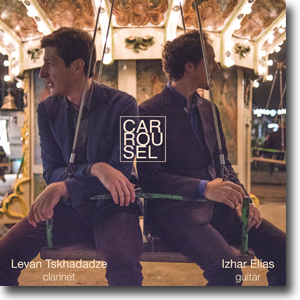 When Levan and Izhar played on a Dutch radio show they first heard Carrousel performed by it's composer and jazz pianist Rembrandt Frerichs. They knew instantly that the piece would work for clarinet and guitar. Rembrandt Frerichs happily agreed to rearrange ''Carousel'' for the duo resulting in a unique intimate arrangement of his composition. Arranging pieces for clarinet and guitar requires a certain outside the box way of thinking. For example lots of pieces for the clarinet are written in B flat, while A major is one of the most common tonalities for the guitar. By tuning the guitar strings up a semitone one can play pieces in B flat while still benefit the use of open strings. Rigoletto’s fantasy (track 4) and the variations on the Carnival of Venice (track 8) where played in this way, by using a different guitar. The recording was made in studio 5 of the Dutch Broadcasting building. The hall is very big and has unique acoustic qualities. The wooden walls and wooden ceiling are acoustically optimized by thousands of acoustic ports, eliminating flutter echo and uneven frequencies. Levan is considered as one of the leading young musicians in Georgia. Levan is a founder and artistic director of the Tbilisi Wind Festival, Kutaisi Classical Music Festival and co-founder of Chiatura Music Academy, where he collaborates with the world’s leading wind players, such as Radovan Vlatkovic, Sergio Azzolini, Maurice Bourgue. He is the winner of the Francois Leleux Wind Competition, and received the Elisabeth Leonskaya Scholarship. Levan performs as a principal clarinettist, soloist and chamber musician with leading orchestras and chamber ensembles worldwide. Izhar is a specialist in early music, chamber music and new music for guitar. Izhar has premiered over 50 new compositions, collaborating with choreographers, experimental film makers and theatre directors. He has given concerts and had been the soloist in concertos with renowned orchestras, in Europe, Russia, south-east Asia and Australia. He has given lectures, and masterclasses on the musical language of the Baroque, Classic and Romantic periods using original instruments and historical methods. Izhar has won many national and international competitions. In 2011 he was awarded the prestigious Dutch Music Prize, the highest musical award given by the Dutch government. The recording was done in 96kHz-24bit PCM. The DSD tranfers were done using a dCS DAC going into the Tascam DSD-recorder.